John Winthrop (1714-1779) was a scientist who was born in Massachusetts and was appointed as the head of Mathematics at Harvard University. 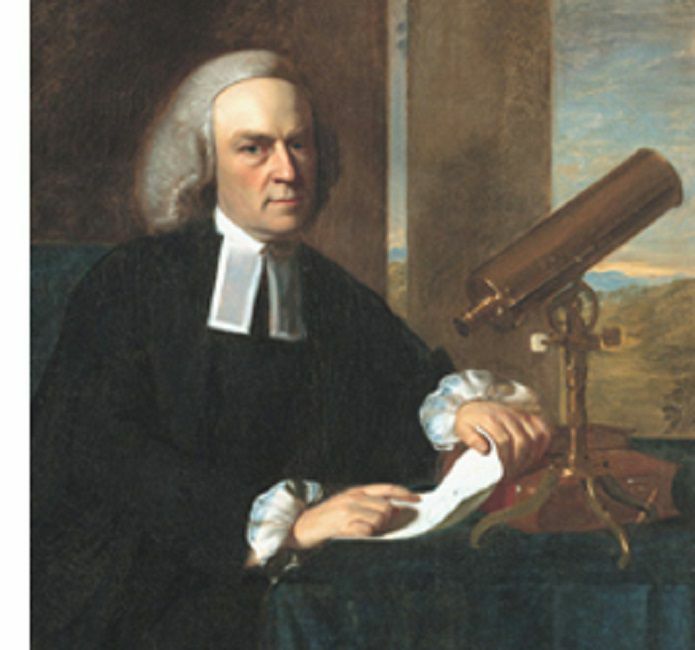 He was recognized as the preeminent American astronomer of his time. Winthrop was the descendant of John Winthrop (1588-1649) who was the first governor of the Massachusetts Bay Colony. He was the son of Judge Adam Winthrop and Anne Wainwright Winthrop. He had been baptized by Cotton Mather. While Mather is remembered for his support of the ​Salem Witch Trials, he was also a keen scientist who researched in hybrids and inoculation. He was extremely smart, finishing grammar school at 13 and going to Harvard through which he graduated in 1732. He was head of his class there. He continued studying at home before eventually being named Harvard's Hollis Professor of Mathematics and Natural Philosophy. He was the first to observe sunspots in Massachusetts in 1739. He followed the movement of Mercury. He determined the accurate longitude for Cambridge where Harvard was located. He published works on meteors, Venus, and solar parallax. He accurately predicted the return of ​​Halley's Comet in 1759. He was the first colonist sent out by a colony to complete a scientific expedition to observe the transit of Venus from Newfoundland. Winthrop, however, did not limit his studies to the field of astronomy. In fact, he was a kind of a scientific/mathematical jack of all trades. He was a highly accomplished mathematician and was the first to introduce the study of Calculus at Harvard. He created America's first experimental physics laboratory. He increased the field of seismology with his study of an earthquake that occurred in New England during 1755. In addition, he studied meteorology, eclipses, and magnetism. He published a number of papers and books about his studies including Lecture on Earthquakes (1755), Answer to Mr. Prince's Letter on Earthquakes (1756), Account of Some Fiery Meteors (1755), and Two Lectures on the Parallax (1769). Due to his scientific activities, he was made a fellow of the Royal Society in 1766 and joined the American Philosophical Society in 1769. In addition, the University of Edinburgh and the University of Harvard both awarded him honorary doctorates. While he did serve as the acting president twice at Harvard University, he never accepted the position on a permanent basis. Winthrop was interested in local politics and public policy. He served as a probate judge in Middlesex County, Massachusetts. In addition, from 1773-1774 he was part of the Governor's Council. Thomas Hutchinson was the governor at this point. This was the time of the Tea Act and the Boston Tea Party that occurred on December 16, 1773. Interestingly, when Governor Thomas Gage would not agree to set aside a day of Thanksgiving as had been the practice, Winthrop was one of a committee of three who drew up a Thanksgiving Proclamation for the colonists who had formed a Provincial Congress led by​​ John Hancock. The other two members were Reverend Joseph Wheeler and Reverend Solomon Lombard. Hancock signed the proclamation which was then published in the Boston Gazette on October 24, 1774. It set aside the day of Thanksgiving for December 15th. Winthrop was involved in the American Revolution including serving as an adviser to the founding fathers including George Washington. Winthrop married Rebecca Townsend in 1746. She died in 1753. Together they had three sons. One of these children was James Winthrop who would also graduate from Harvard. He was old enough to serve in the Revolutionary War for the colonists and was wounded at the Battle of Bunker Hill. He later served as the librarian at Harvard. In 1756, he again married, this time to Hannah Fayerweather Tolman. Hannah was good friends with Mercy Otis Warren and Abigail Adams and carried on correspondence with them for many years. She along with these two women were given the responsibility of questioning women who were thought to be siding with the British against the colonists. John Winthrop died on May 3, 1779, in Cambridge, survived by his wife.